Ming Tai Screen Printing Machine Co., Ltd.
2. Electronics-FPC (Flexible Circuits),Membrane Switch,IMD and Diffusers etc. 3. Specialized labels for UL/CSA,wine and liquor bottles, cosmetics and shampoo bottles, as well as industrial, toy, automotive, compact disc and video products. 4. Nameplates and graphic overlays. 1. Model: MT-5070. 2. Max.printing area: 500 x 700mm. 3. Max.size of screen frame: 800 x 1100 mm. 4. Mim. size of screen frame: 800 x 700 mm. 5. Max.material diameter: Φ500 mm. 6. Unwinder core diameter: Φ75 mm. 7. Max. rewinding diameter: Φ500 mm. 8. Winder core diameter: Φ75 mm. 9. Machine Speed: 600 m/hr. 10.Travel: 800 mm. 11.Thickness of material: 0.025-0.5 mm. 12.Positioning accuracy: ±0.03 mm. 13.Squeegee drive motor ( servo ): 0.75kw. 14.Take up drive motor ( servo ): 1 kw. 15.Unwinding motor: 1 HP. 16.Winding motor: 1 HP. 17.Platen vacuum motor: 1/2 HP. 18.Take up roller vacuum motor: 1/2 HP. 19.Air compressor motor: 2 HP. 20.Working air pressure: 5-7 kg/cm2. 21.Machine Weight( L x W x H ): 1350 KGS/L3430xW1300xH2000(mm). 22.Feeder Weight(L x W x H): 350 KGS/L630xW1170xH1050(mm). 23.Winder Weight( L x W x H ): 350KGS/L700xW1170xH1400(mm). 24.Rewinder Weight( L x W x H ): 450KGS/L660xW1100xH1050(mm). 1. User-friendly PC based control combined with touch screen monitor for maximum operation convenience. 2. 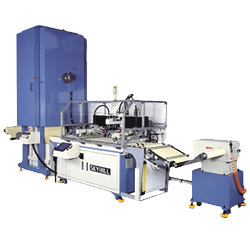 The printing head is raised vertically for convenient access to screen and squeegee. 3. Vacuum suction table for efficient workpiece fixing,with blow back function. 4. The squeegee mechanism has a pressure stabilizer ensuring constant pressure at all times. 6. Aluminum alloy machine frame ensures high stability and no deformation. 7. Safety guard with CE standard provides extra safety for the operator and machine. 8. Winding and unwinding use air shaft to prevent slippage, and include advanced web guide for precision and neatness. 9. The take up roller features vacuum suction,ensuring smooth film surface and proper film tension at all times.